Difficulty Notes: No major difficulties for seasoned off trail scramblers. 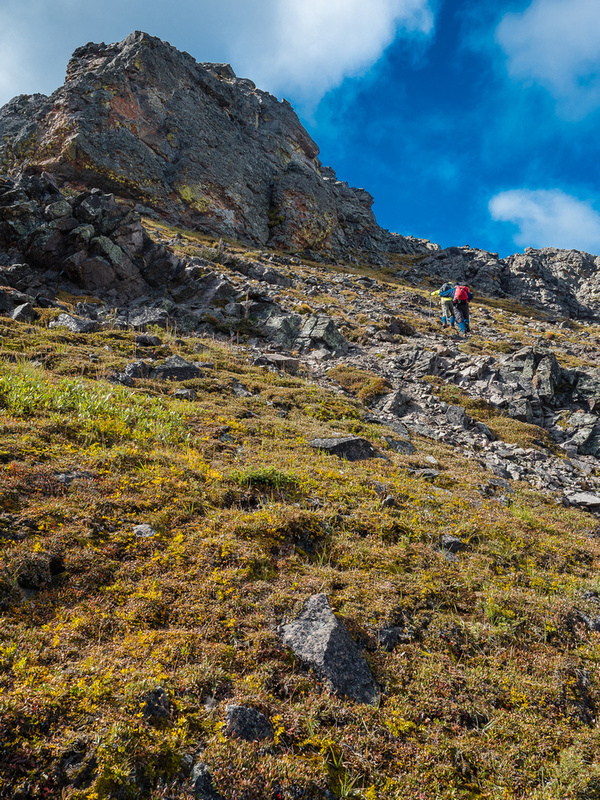 An easy, but steep scramble to the summit when approaching from McGillivray Ridge. The route from the col to the summit of Ma Butte was obvious. Head up! So that’s exactly what we did. We stuck to the north (climber’s right) side of the ridge and were soon scrambling easily up to the summit ridge. 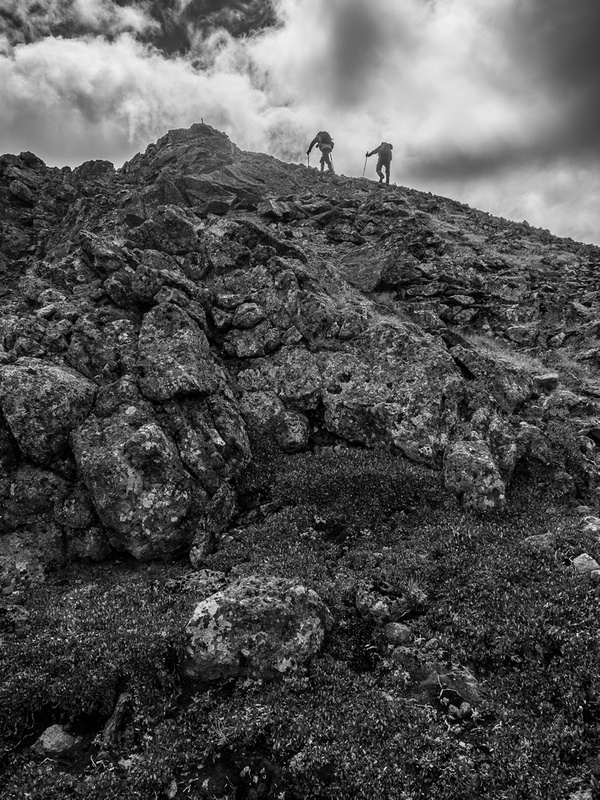 We avoided the loose gully just under the summit by traversing across it and then back to climber’s left to gain the summit from the NW – just underneath it. This was the obvious route of least resistance. 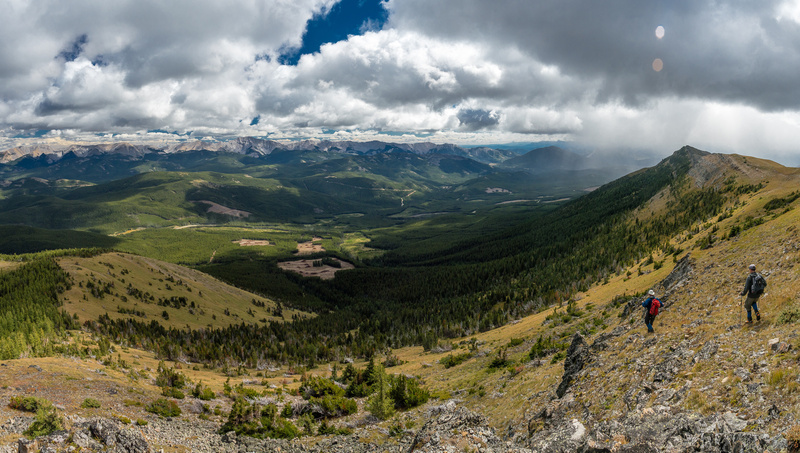 We broke onto the summit to some pretty sweet views of Crowsnest Mountain and the surrounding area. Crowsnest Mountain (L), Seven Sisters (C) and Allison / Window / Ward (R) to the west of Ma Butte. 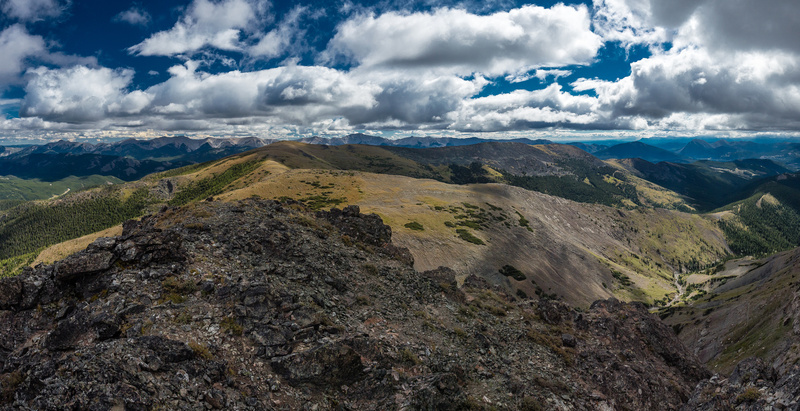 We enjoyed the summit views before noticing yet another threatening storm system coming in from the west. So far we’d been lucky with all the rain / snow stopping at Crowsnest Mountain but the clouds were starting to make it further and further east so we didn’t push our luck. Descent back to the McGillivray col was quick and easy. From there we looked back up at the ridge, reluctantly realizing that we now had to regain it. Bob indicates only 600 vertical meters for both peaks, but he didn’t count the 300+ extra from the ridge to Ma Butte and back again. 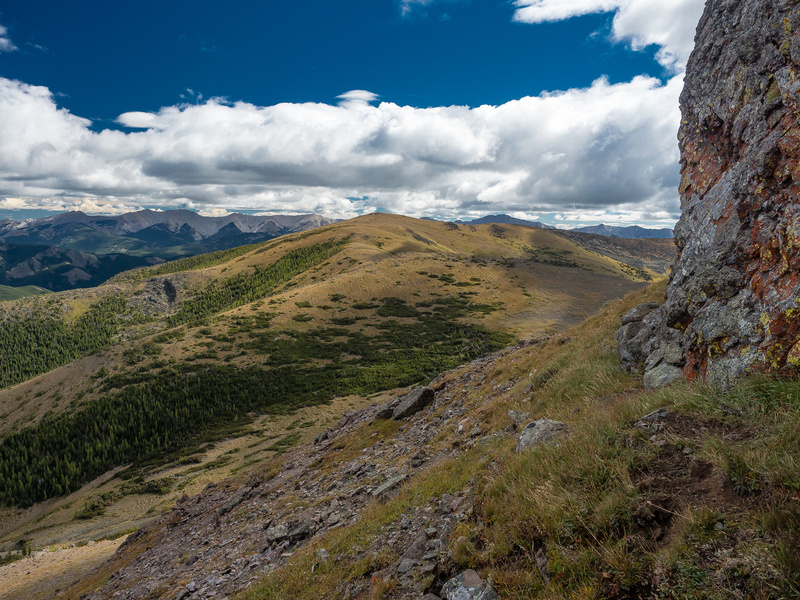 From the summit of McGillivray Ridge we descended east slopes, bypassing a low cliff band before following an obvious dirt bike trail down to the east. Where the trail turned left, we started off-roading ourselves. 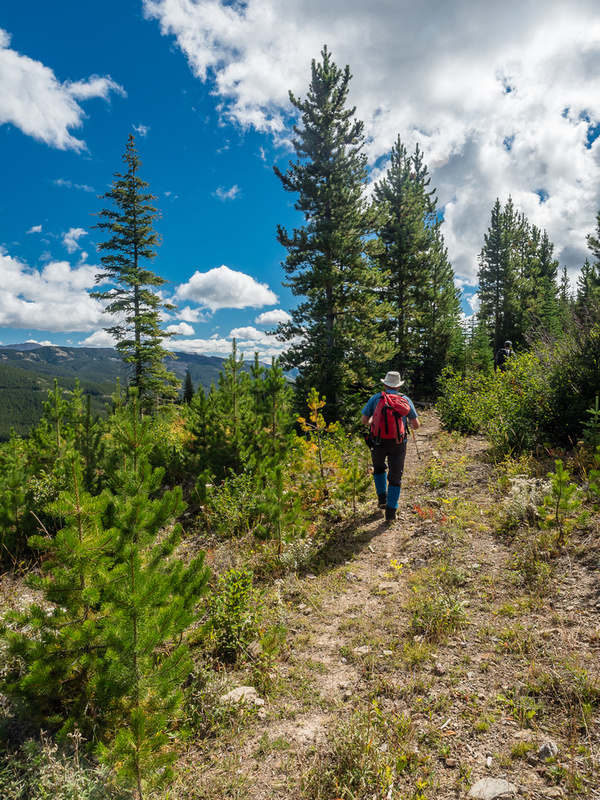 There are literally a dozen ways to exit the east side of McGillivray Ridge – pick your poison. We descended various bits of trails / cut-blocks and finally just bushwhacked out to the road which we followed 2km back to the car. Starting down the easy west side of McGillivray Ridge, headed to the symmetrical form of Ma Butte. 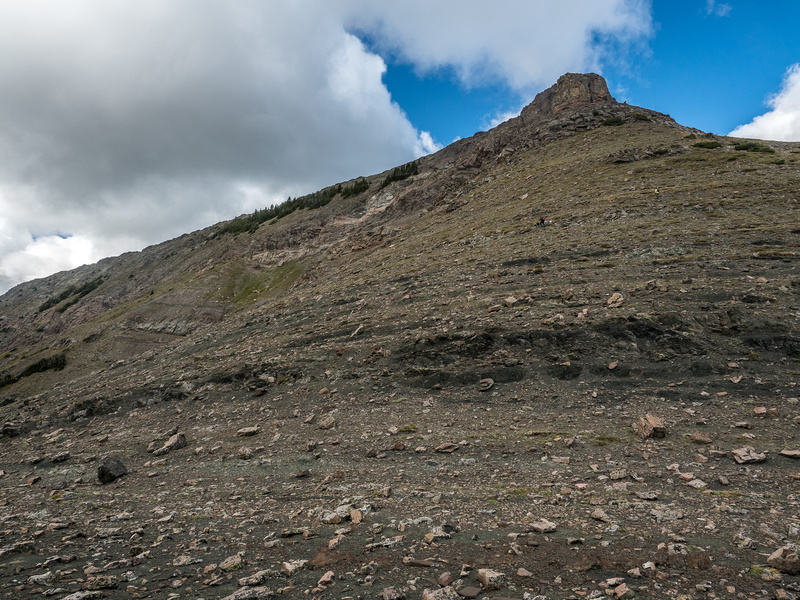 Looking up at several hundred meters to the summit of Ma Butte from the col. I think Ma Butte deserves a "scrambling" rating - even though it's very easy. 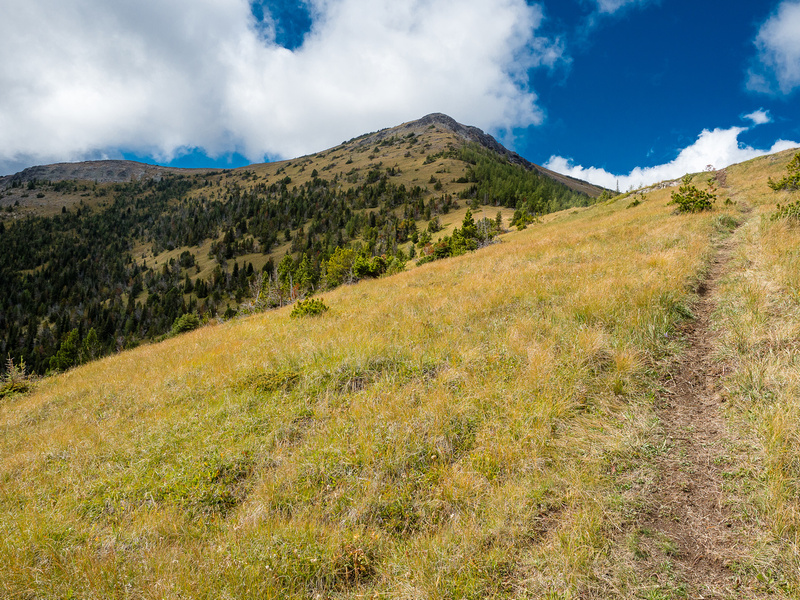 Some hikers won't like the steep, loose terrain to the summit. Fall colors in the alpine as we head across the north end of the butte. 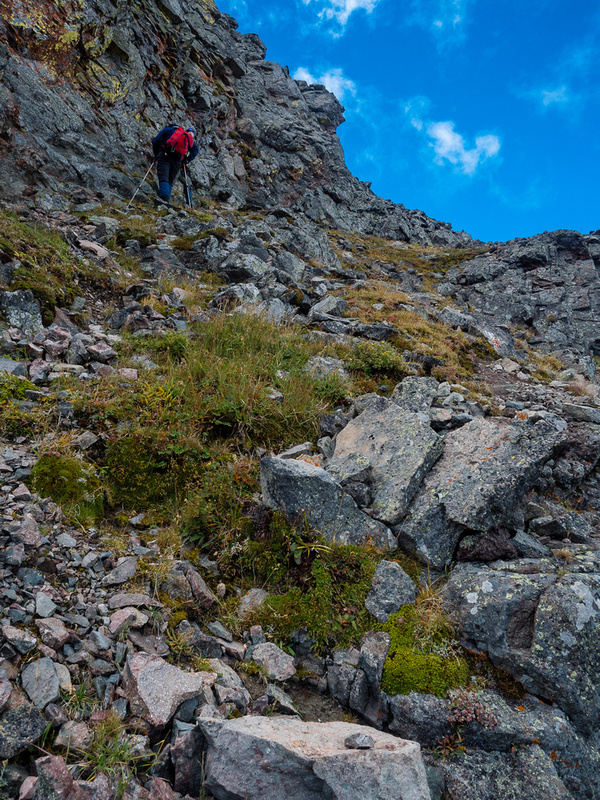 The scrambling is never difficult if you keep traversing under the summit. 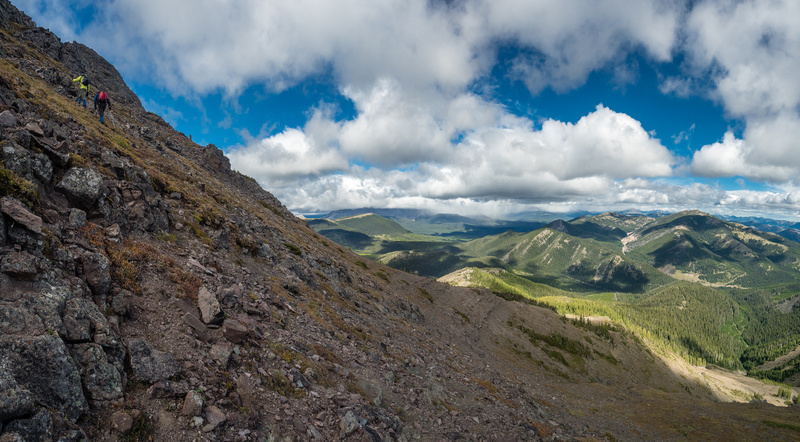 Looking back at McGillivray Ridge from under the summit block of Ma Butte. There is a steeper, loose gully OOS to the left, but the easiest route is to simply gain the NW ridge that Wietse and Dave are on and then traverse it back to the left to the summit. From the NW ridge, looking to the summit of Ma Butte which is only 2 minutes away. 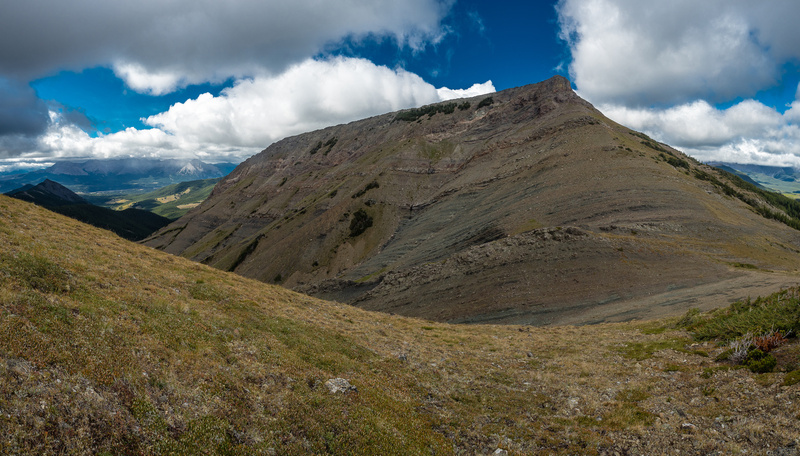 The spine of Ma Butte stretches south towards Crowsnest Pass. Crowsnest Mountain at right. Looking north from the summit at an unnamed ridge with McGillivray at far right. The unnamed ridge at left is almost as high as Ma Butte. Thrift Peak and Thunder Mountain at right in the distance. 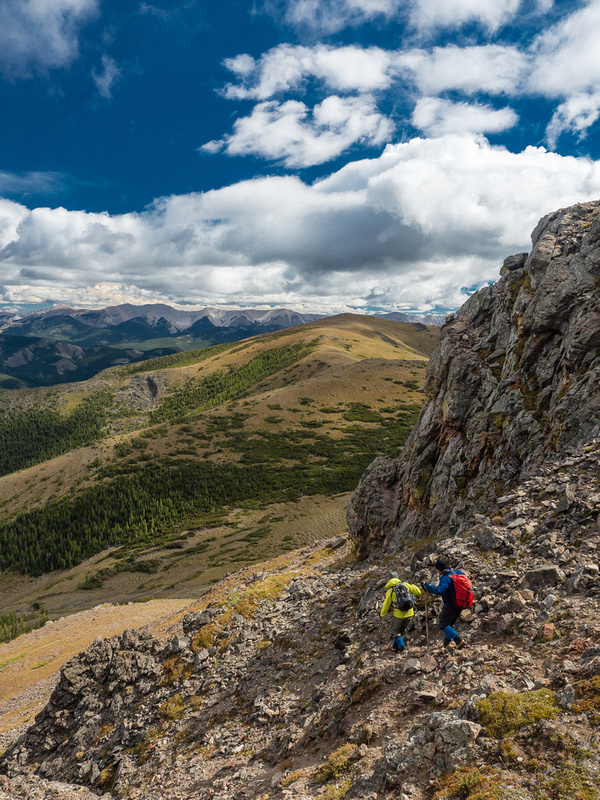 McGillivray Ridge extends south, just to the east, and is the easiest way to access Ma Butte and get a two peak day. Descending the north end of the butte - the only scrambling on this peak and it's pretty easy. We're now over the summit of McGillivray Ridge and descending eastern slopes to hwy 40 below. This ridge could easily be used to access McGillivray Ridge (above) and Ma Butte. This is looking back up the dirt bike track we descended. 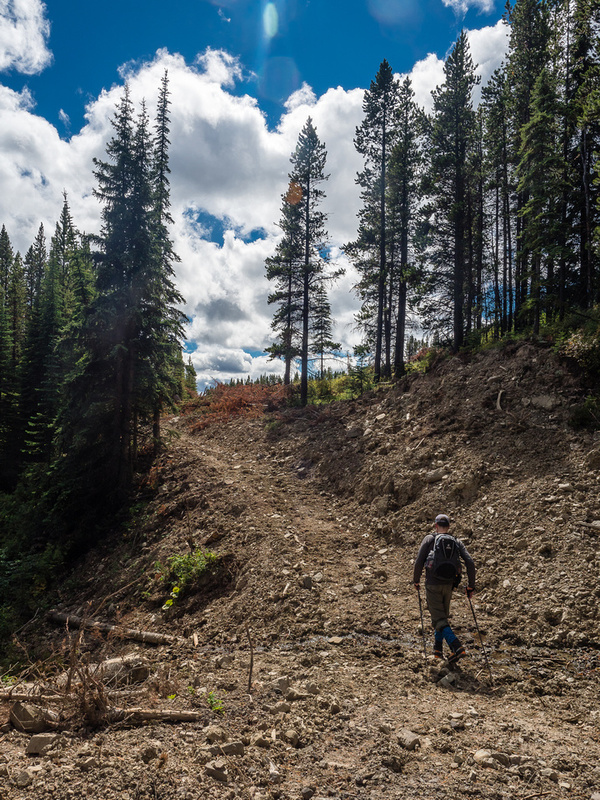 There are many ways down and up McGillivray Ridge - logging roads will get you a good ways along but eventually you'll either be on game trails, dirt bike trails or your own track through light bush. Hiking along an older logging road towards our car - eventually we gave up and simply bushwhacked to hwy 40 to our left. 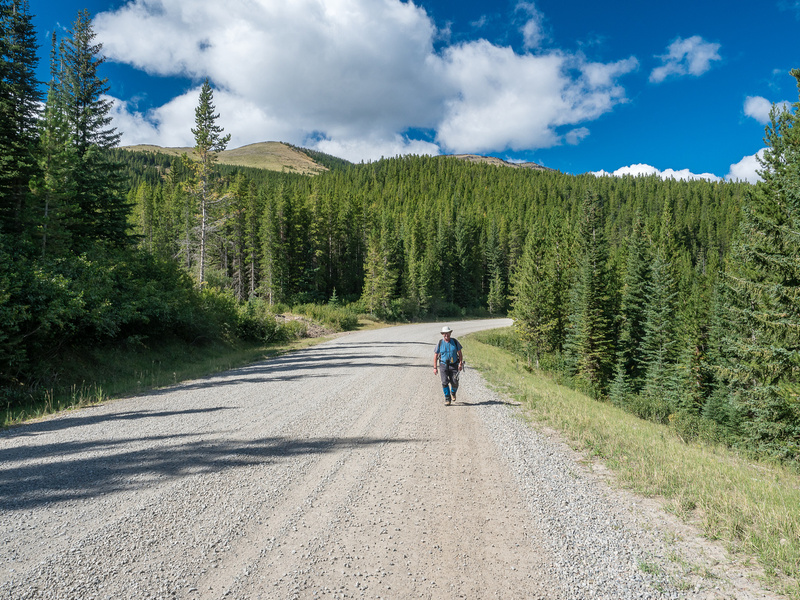 Dave walks back to the car along the forestry trunk road - hwy 40 with McGillivray Ridge high above on the left.